Come disconnect from life for one week and live the cowboy lifestyle you have always dreamed of. Come ride the drive and experience the ultimate horse-back adventure as you herd over 40 horses across 100,000 acres of wide open mountainous terrain. During the drive you will ride into two beautiful campsites that feature rustic outdoor accommodations including both a natural warm spring and a cold Idahoan creek to bathe in. Following you along the drive is Silver Spur’s famous chuck wagon carrying all the ingredients to some of the best over-the-fire cowboy cooked meals. This world-famous horse drive is one of the toughest and yet most rewarding adventures you will ever have on horseback. 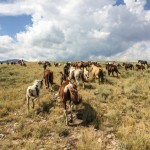 With the help of your horse and other guests, together you will herd over 40 horses for nearly 20 miles each day. This drive is for those looking for a real authentic, fast paced, American horse drive. Your first and last nights will be at the ranch, located next to the Targhee National Forest along the Great continental divide sits The Silver Spur Ranch. At the ranch there is a beautiful rustic lodge including a dining hall and living room for relaxing and socializing. Alongside the famous rustic lodge sits your cabin accommodations, they have true cowboy character yet are very clean and comfortable. The hot outdoor shower is a favourite of all guests, especially after a long hard day in the saddle. There is no wi-fi, phone signal, or anything else to that extant at the ranch, it's the greatest place on earth to disconnect from the world and truly enjoy the American West! From £1599 pp - Ranch and camp accommodation, meals, horses, tack, activities and taxes.